The whole idea of "N+1" implies a problem with an unattainable solution. I collect antique cameras, and will never have enough eyes or hands to use them all simultaneously, but somehow I always want more and struggle to find time for all of them. My dad has six motorcycles. Being merely mortal he has but one set of hands and feet, but still finds time to race some, tour on others, and still more time to work on all of them. Thankfully for Steve Cooper his whole family enjoys Porsches, and three 993 GT2's is exactly the right amount. Each of these three 993 GT2s is slightly different, with different levels of preparation and provenance. The yellow car above is the genuine article; a real GT2. Porsche made just one hundred and ninety four 993 GT2s worldwide. This example spends its time in competition as Porsche intended, and is not simply pampered as many GT2s are today. The yellow car is usually driven by Steve's daughter, Emily. The current spec includes a 3.6l twin turbo engine, 993 Turbo suspension, and a full cage. 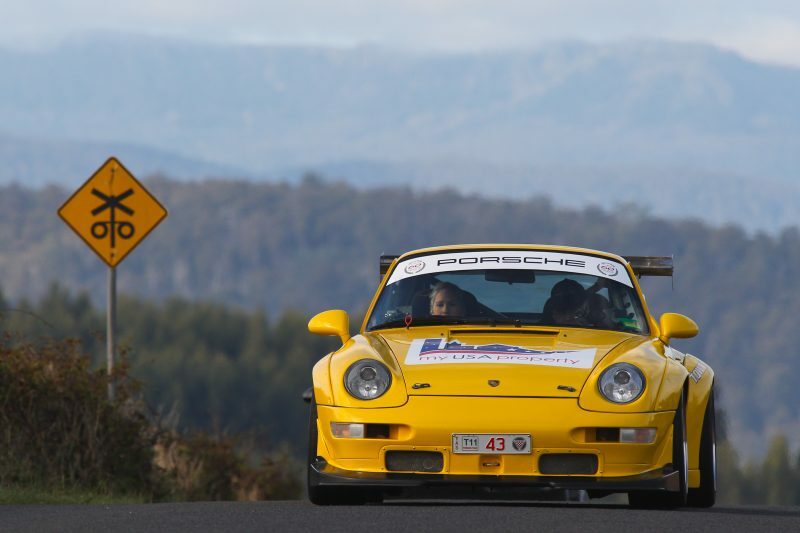 The car is used for track days, plus the 2007 Noosa Targa in 2007 and the Tassie Targa tour group in 2011. The blue car is not a genuine GT2, but was built up to that specification. Bountiful extra performance is provided by genuine 993 GT2 Evo 2 parts. The engine has been opened up from the stock 3.6l to a full 3.8l, and is good for a somewhat astonishing 550 horsepower. Steve's car is based on a 993 Turbo shell. The finished product is said to weigh just 1200 kilograms, or about 2600 pounds. As we said, in this case Porsche obsession is truly a family affair, and the car above is Lee Cooper's (Steve's wife) racer. This plum-colored car was built from a 993 Turbo shell, much like her husband's blue car. 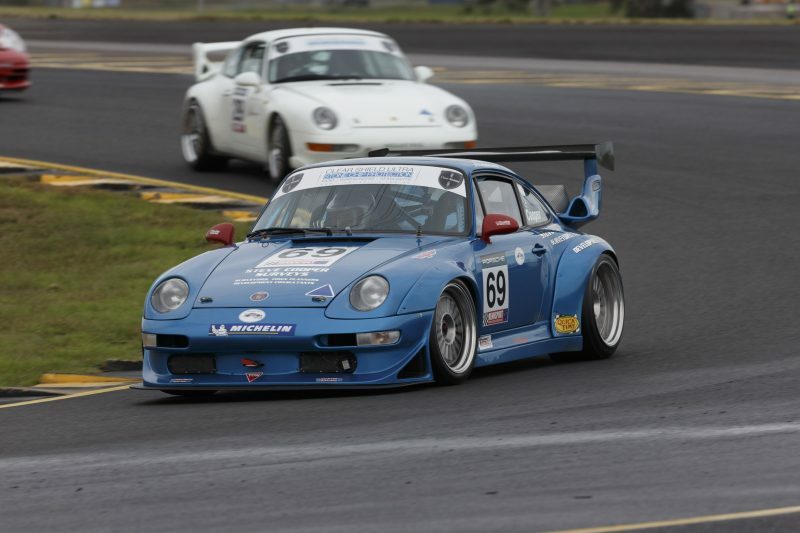 This 993 has been racing for substantially longer than Steve's car; competing since at least the early 2000s, and was Porsche Cup Champion circa 2003. Steve and Lee's son, Cameron, has not been left out of racing Porsches. 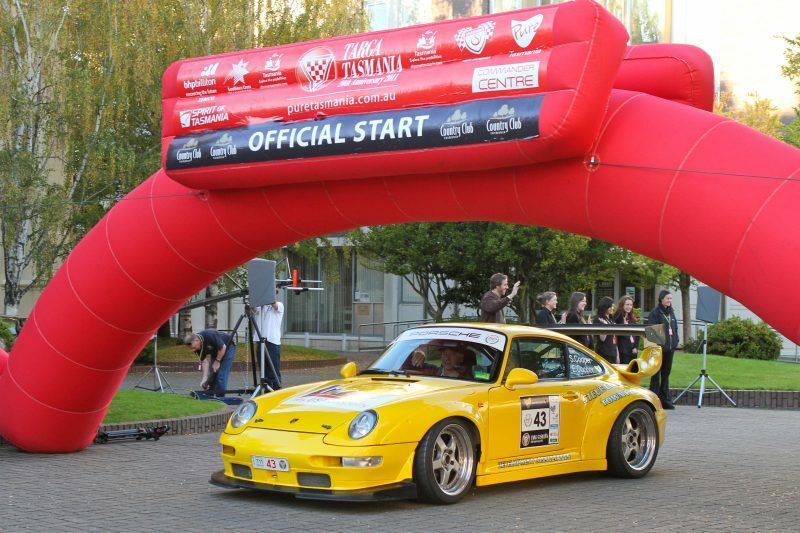 Rather than competing in a 993-based car, Cameron drives a 2002 Porsche 996 Cup car. Having one family member in the water-cooled camp must make things rather colorful in a family as competition-oriented as this. Steve has provided us with a substantial gallery of photos of his family's 993s, so please enjoy the gallery below. If you are interested in having your Porsche (or Porsche) featured on FLATSIXES.com, please contact us with a picture and short description of your car, and we'll work with you to share your Porsche passion with the world. During the Porsche RENNSPORT Australia, in Sydney, Australia, May 01, 2016. Think the air-cooled market is softening? Think again!